The last two Heisman Trophy winners were quarterbacks who transferred to Oklahoma and played under young Sooners coach Lincoln Riley. Jalen Hurts, one of the most successful quarterbacks in Alabama history, will try to make it 3-for-3 next season. The last two [Heisman Trophy winners](https://www.heisman.com/heisman-winners/) were quarterbacks who transferred to Oklahoma and played under Sooners coach Lincoln Riley. Jalen Hurts, one of the most successful quarterbacks in Alabama history, will try to make it 3-for-3 next season. The 20-year-old, who graduated from Bama last month with a degree in public relations, will play next season at Oklahoma, [he announced Wednesday](https://www.theplayerstribune.com/en-us/articles/jalen-hurts-thank-you-alabama). Since he'll be a graduate student, he'll be eligible to play immediately. The move was somewhat of a surprise, as odds from BetOnline.ag just yesterday [had Hurts at 1/2 odds](https://www.betchicago.com/odds-win-2019-heisman-trophy-rules-winners) to be [playing for Maryland](https://twitter.com/betonline_ag/status/1085269690698616833) in the 2019 season-opener. He was only 14/1 to be with Oklahoma [as of less than a week ago](https://twitter.com/OddsShark/status/1083469210746011649). Hurts was [spotted Friday at the Terps' basketball game](https://www.foxsports.com/college-basketball/video/1424580163981) (he [reportedly visited](http://www.espn.com/college-football/story/_/id/25778069/alabama-quarterback-jalen-hurts-transfer-oklahoma-senior-season) Oklahoma on Saturday and Miami on Sunday), but opted for the Sooners, who had their 2018 season end at the hands of the Tide in the College Football Playoff semifinals less than three weeks ago. __PLAY:__ Our [NFL Conference Championship Pick 6](https://betchicago.chalkline.com/games/sunday-nfl-challenge). Correctly answer six prop questions about Sunday's Rams-Saints and Patriots-Chiefs games to win a BetChicago prize pack. 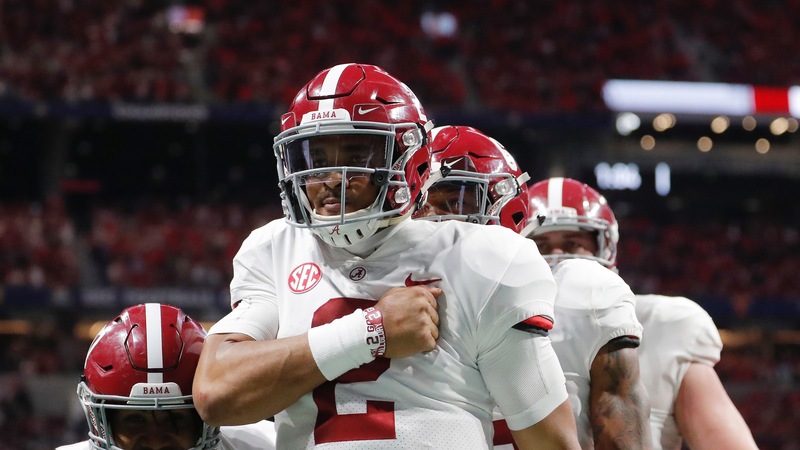 ## Jalen Hurts Heisman odds Hurts, who was 24-2 as Alabama's starter, was 9/1 as of Tuesday to win next season's Heisman Trophy, behind CFP national championship game MVP Trevor Lawrence of Clemson (3/1) and the guy who took Hurts' job at Alabama, Tua Tagovailoa, at 4/1. With the news he's headed for Oklahoma, Hurts moved to 6/1 on Wednesday. <a href="https://twitter.com/DaveMasonBOL/status/1085627290300616707" class="embedly-card" data-card-width="100%" data-card-controls="0">Embedded content: https://twitter.com/DaveMasonBOL/status/1085627290300616707</a> Hurts threw for more than 300 yards in a game only once in two seasons as Alabama's starting QB, but his running ability is what made him so successful, with 954 yards and 13 touchdowns rushing in 2016 and 855 yards and eight TDs on the ground in 2017. (And remember, unlike the NFL, sacks come off a player's rushing total in college football.) He accounted for 71 touchdowns in three seasons (48 passing, 23 rushing) with only 12 interceptions, and appeared in all but two of the Tide's games last season despite being the backup. Only A.J. McCarron and Greg McElroy had higher career passer ratings at Alabama for quarterbacks with a minimum of 650 pass attempts. Baker Mayfield was second in the nation in passing yards in 2017, when he won the Heisman, and Kyler Murray was third last year, when he took the trophy, and both led the county in yards per attempt. Hurts' strong suit has never been getting the ball downfield, so it'll be interesting to see how Riley utilizes him. Oklahoma's title odds moved up some places with the news. <a href="https://twitter.com/Covers_Vegas/status/1085630537614540800" class="embedly-card" data-card-width="100%" data-card-controls="0">Embedded content: https://twitter.com/Covers_Vegas/status/1085630537614540800</a> At other books, they didn't budge from the 15 or 16/1 they opened at, but that is still a smaller number than last season at this time, when the Sooners were 18/1 [to win it all](https://www.sbnation.com/college-football/2018/1/8/16865568/college-football-rankings-2018-early-playoff-odds). Oklahoma, which went 12-2 the last two seasons, has a favorable schedule next season, playing only two opponents -- No. 9 Texas and No. 20 West Virginia -- that finished in the top-25. The Red River Rivalry game, as usual, will be played at a neutral site, while the WVU game is at home.